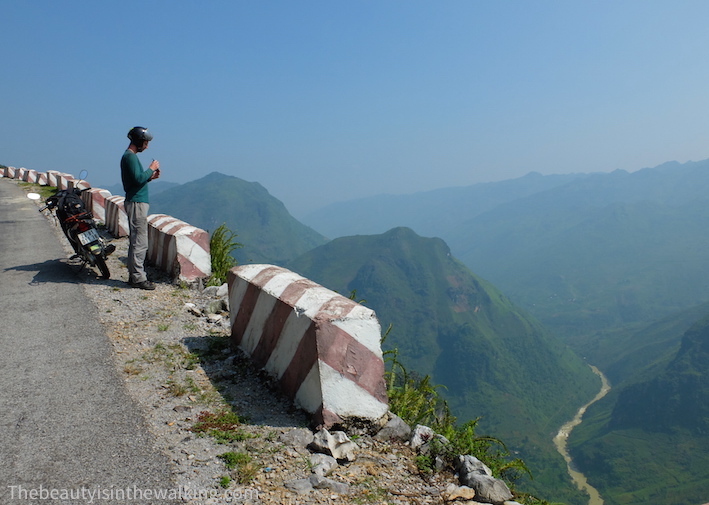 Here is the Part 2 of our trip to the Hà Giang Loop. If you’ve missed Part 1 and need a cach-up session, then go this way: read Part 1. 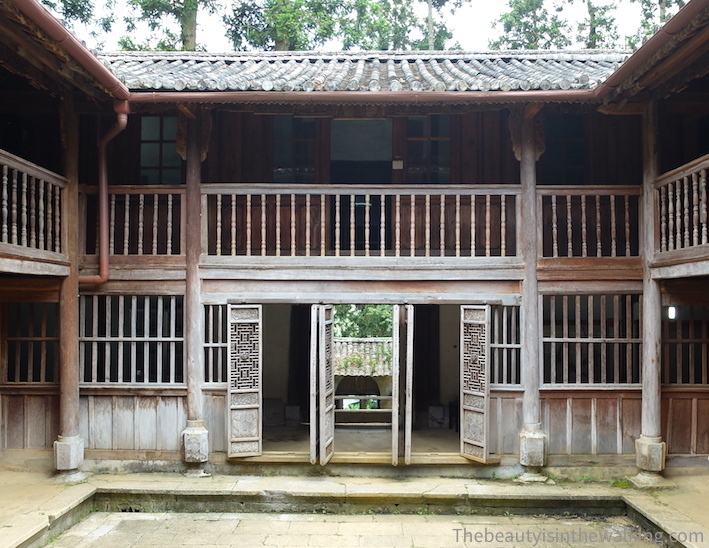 This morning, we want to go back to visit the house of the Vương Family in the municipality of Sà Phìn. 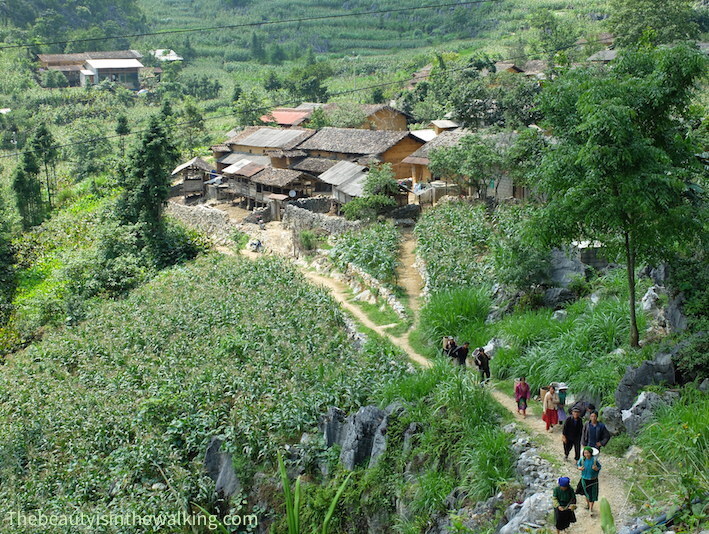 Then, our route will follow a triangle by going to Lũng Cú, the northern village of Vietnam and back to Đồng Văn. 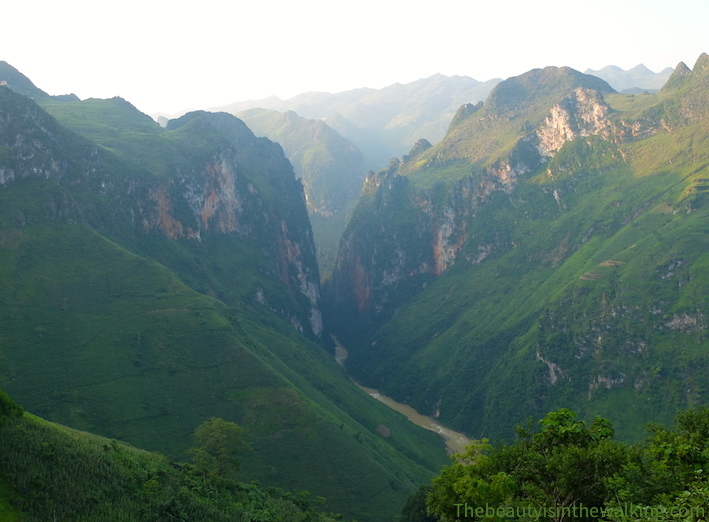 If we have enough time, we will continue our way towards Mèo Vạc and spend the night there. The French couple we met in Hà Giang will also be there and we plan to have dinner together. 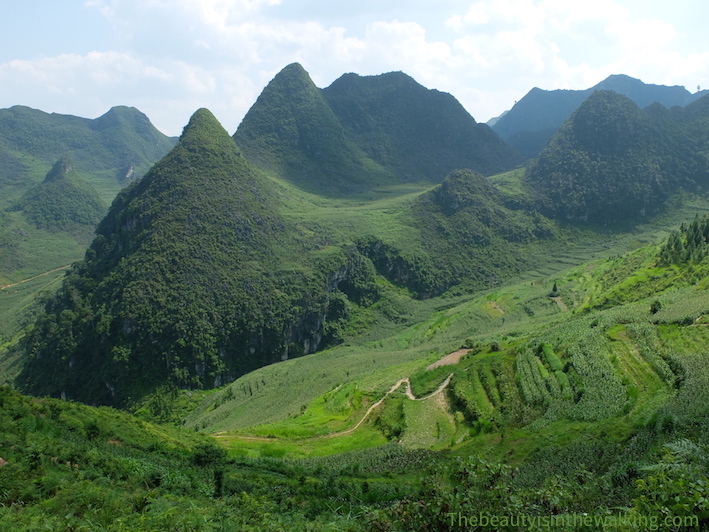 The house of the Vương Family is established at the far end of a valley surrounded by a few of those conical mountains. It is barely visible from the road as it is hidden in the middle of a small forest. When we come to the village where the house is situated, we are the only Westerners and people show us the way without our asking for it. The Vương House is located in the middle of a small forest. 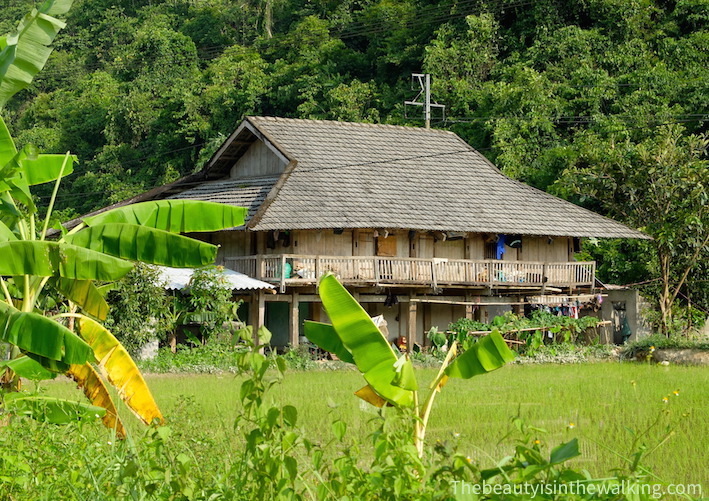 The house was built at the beginning of the previous century at the request of Vương Chính Đức, who was proclaimed leader by the Hmong community when he was 30. 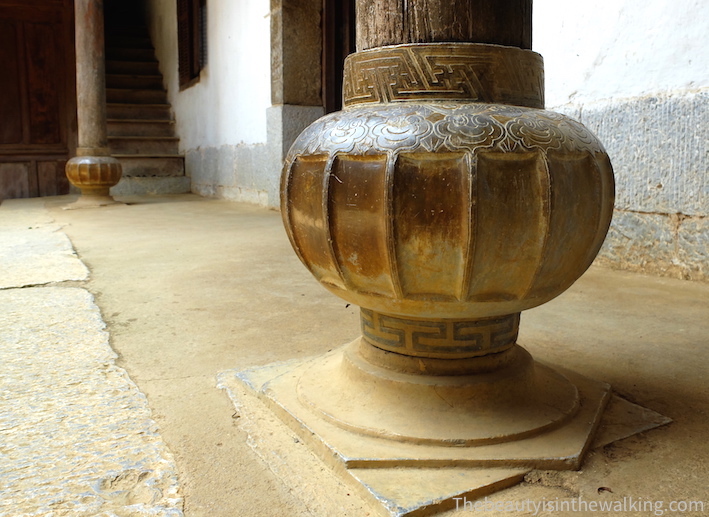 He became rich and powerful thanks to the opium culture and trade, and controlled the whole area of Đồng Văn. 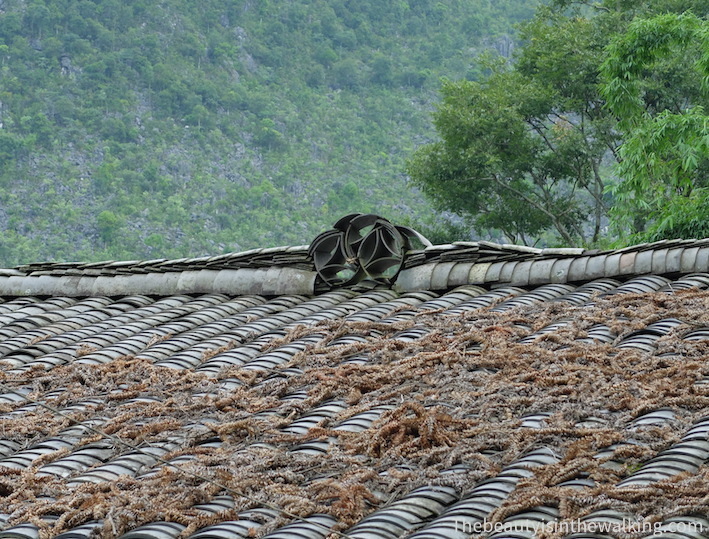 The house is a combination of Chinese and Hmong traditional architectures, using materials from Yunnan (China), as well as local ones, such as limestone, ironwood (very resistant), and double tiles. 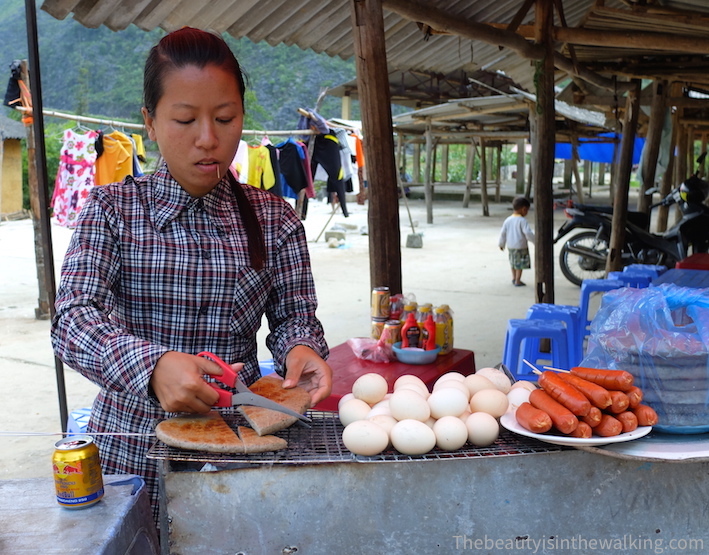 After the visit and a brief stop at the local shop, Yen attracts us to her stall, where her local greyish pancakes arouse our curiosity. “Tam giác mạch”, she says. This is the name of the grains they are made of and which come from a plant with pale pink flowers. Their shape with “facets” reminds us of buckwheat. Yen cuts one pancake with scissors and we sit down for a little while on the mini blue plastic stools arrayed just in front of the stall. The pancake has the soft and airy texture of bread, and a slightly sweet taste. 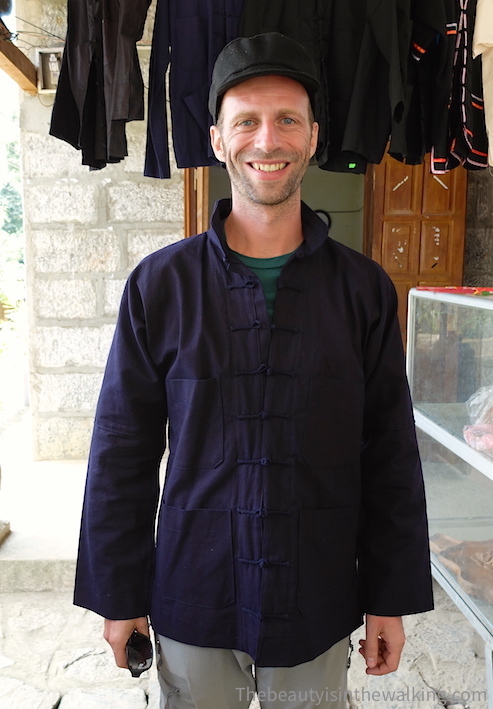 Erik is wearing Hmong clothes. Yen is cutting a pancake made of “Tam giác mạch”, local cereal. Yen is reviving a few embers to cook a buffalo sausage. The air is mild, the light is gentle and Yen is good company. We chat, with gestures, English and Vietnamese words. 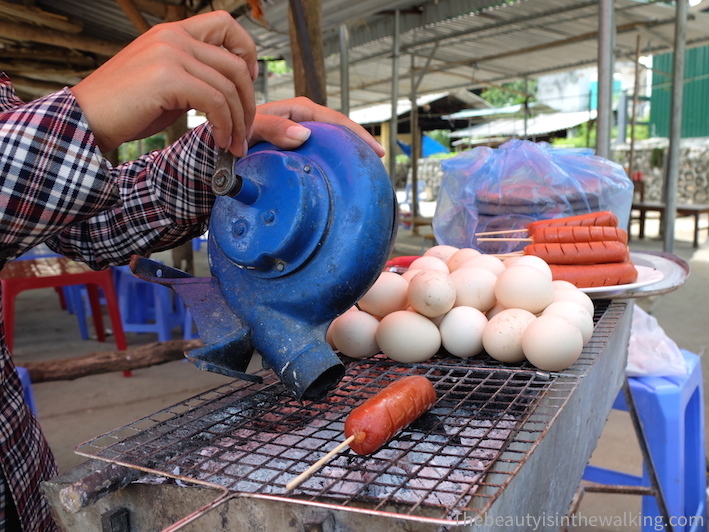 Erik orders two buffalo sausages roasted on a few embers that Yen barely revives with the help of a strange bellow with a crank handle. 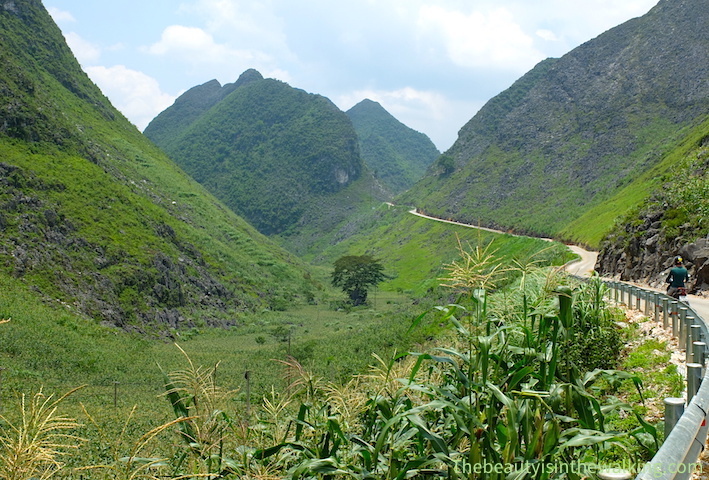 Then comes the time to leave and take the road towards Lũng Cú, the northernmost point of Vietnam. 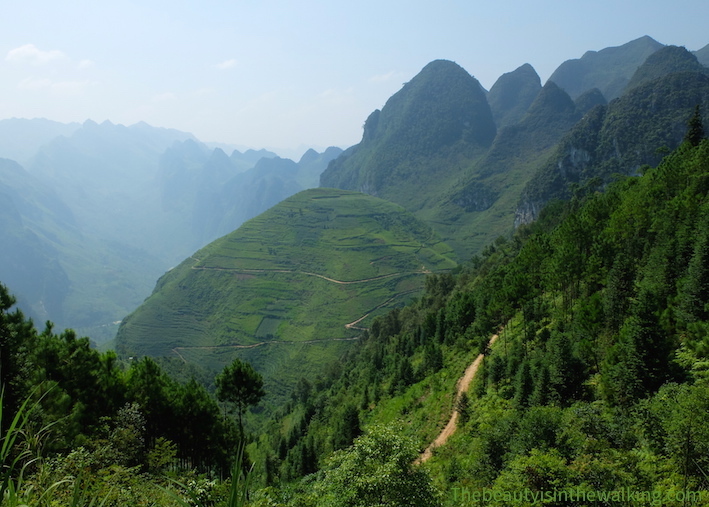 If we are lucky enough, we will be able to catch a glimpse of China, like a foretaste of the next stages of our trip. 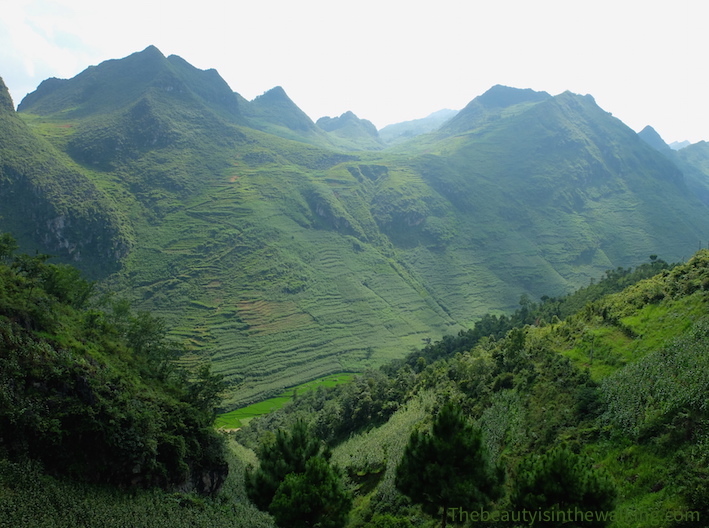 Again, the landscape is absolutely breathtaking, spectacular, and all in green shades. Not a single inch of earth has been forgotten: cultivated fields as far as the eye can see! No matter the degree of the slope, something has been planted or sown. These people are amazing; they do a tremendous work on these high lands. They are adapted to their environment and are completely at ease. While we are riding on even more sinuous roads, hardly anybody can be seen around. Only a few locals quickly overtake us or a few women with their kids, coming out from the fields, carry on their backs a load of plants or wood. From a distance, they look like walking bushes. 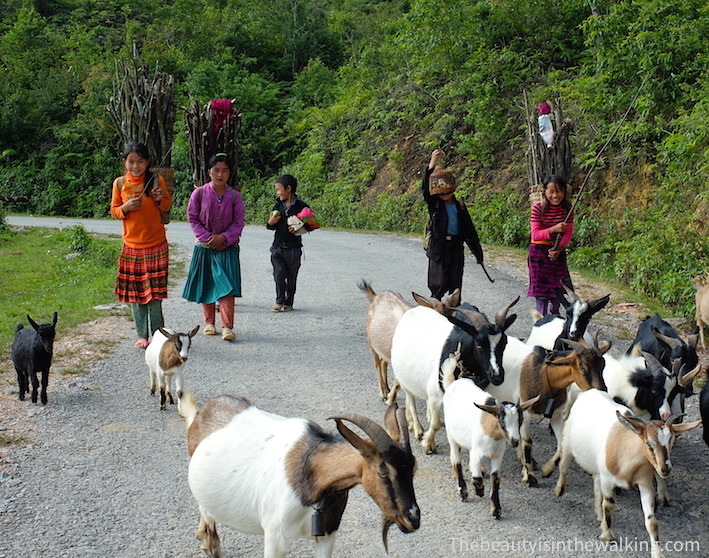 Sometimes, they are accompanied by a herd of goats or buffaloes. 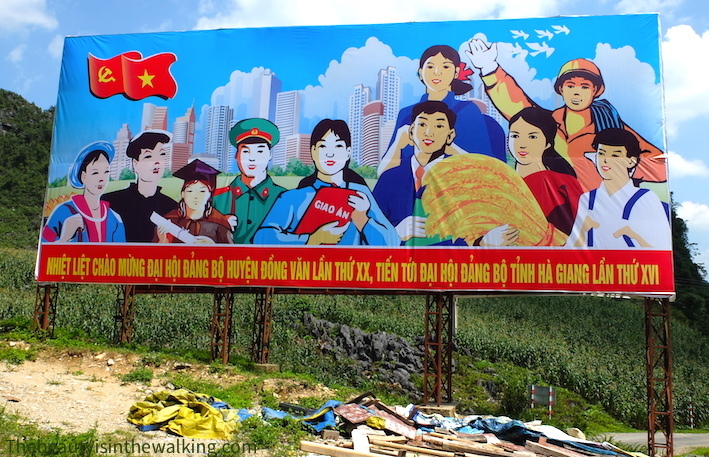 We finally reach Lũng Cú village and we notice the monument that shows the northernmost point. Suddenly we are in a sweat having a look at our watch that says… 4:00 pm. Argl… We had lost track of the time! 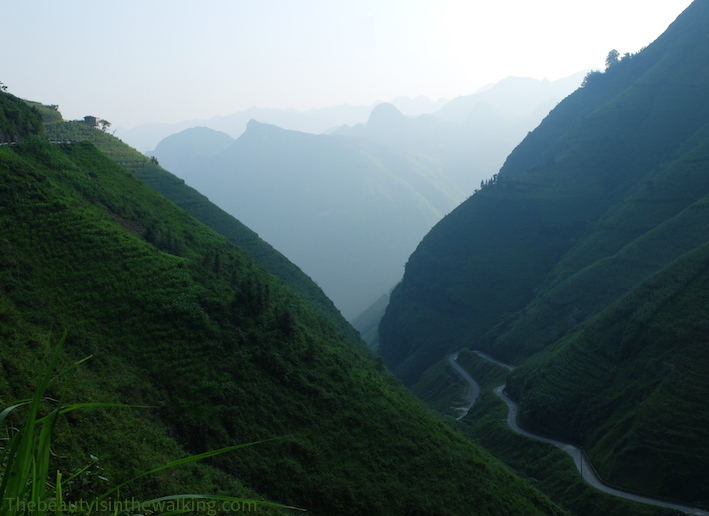 We still have the same distance to ride back to Đồng Văn, plus another 20 km, which means an hour more to Mèo Vạc. So, no time to walk up to the viewpoint. We must be on our way back; too bad! China will be for another time. 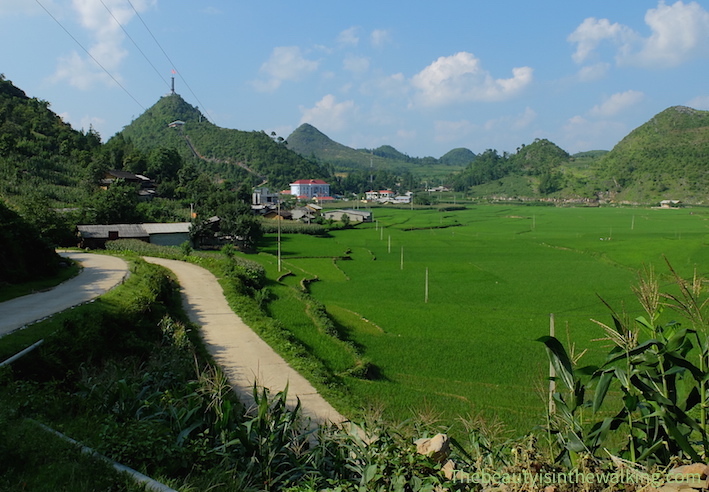 We finally reach Đồng Văn and start riding along the road towards Mèo Vạc. It is known to be the most beautiful part of the loop. And this is the best time of the day: woohoo! It makes the same impression as one of those sweets we were given at kindergarten and that we slowly sucked, eyes wide opened and a smile carved on our young faces. All we’ve seen so far can compare to this road. The evening light makes the show even most enjoyable. Green shades are exploding everywhere around and we are literally enthralled. 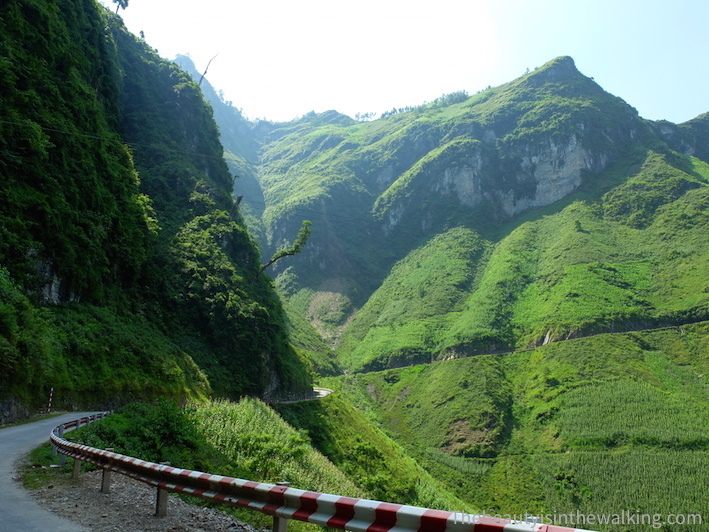 Between Đồng Văn and Mai Pi Leng Pass. 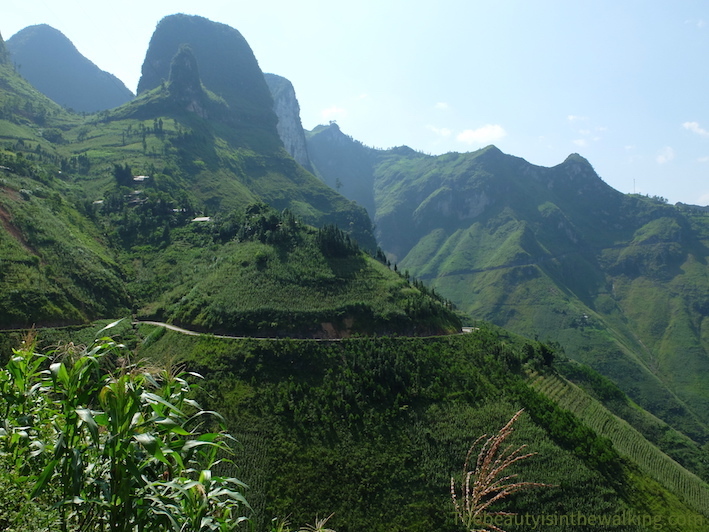 First, we pass through a series of mountains in the shape of incense cones, around which the road is wrapped. They are covered in cornfields, and sometimes a tree has taken root on top. 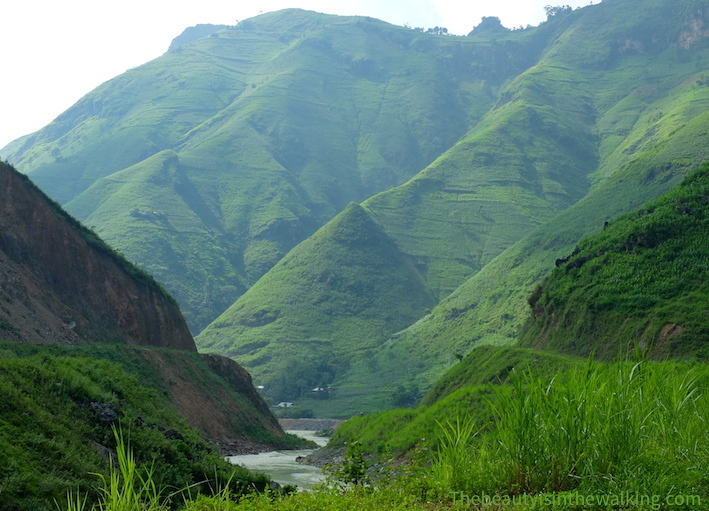 Then, we embark onto the Mai Pi Leng Pass, the most dangerous road in the area, which reveals some long green slopes. 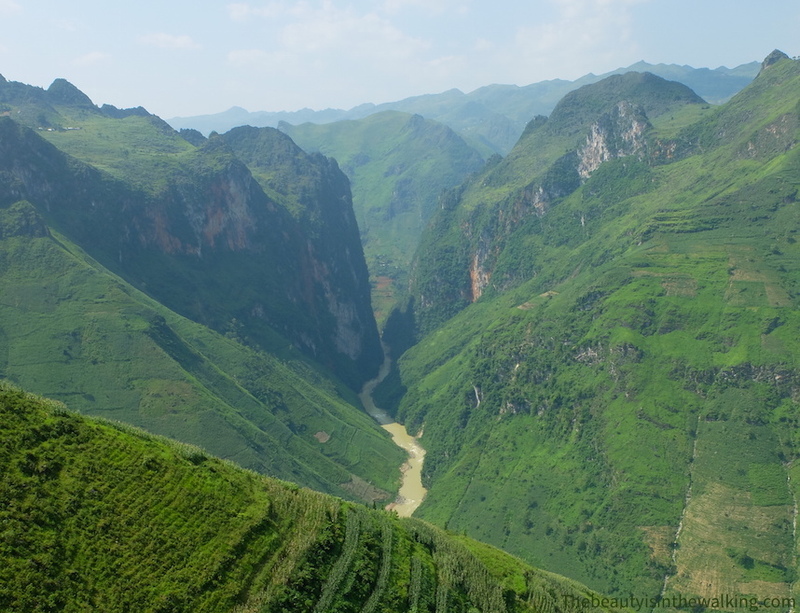 At the bottom of the valley, a river rushes into a deep canyon. We stop at every bend, letting out a “wow!” and sighs of wonder. This is magnificent, majestic; we are enraptured! That evening, we finally have dinner with our friends in a good little restaurant. The next day, we have planned to go back early on the same road in order to enjoy the landscape under the morning light and explore the surroundings. 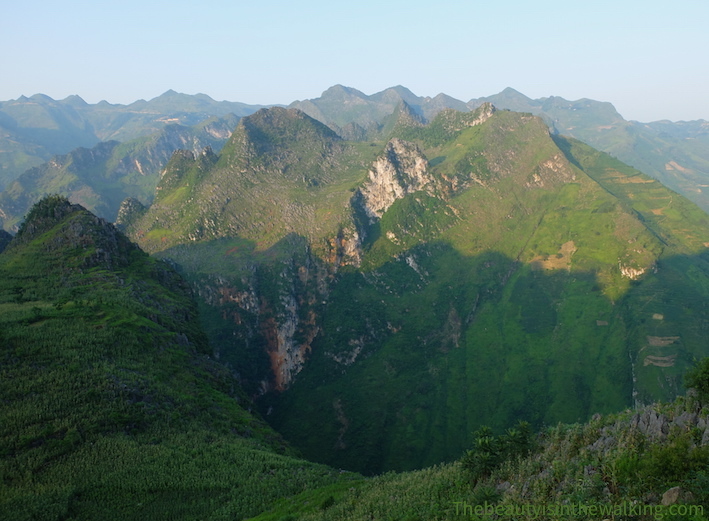 The Hà Giang loop can be done within three days but for lack of time and ease of transport we finally decided to forget about Ba Be Lake, which is further east, and we spent one more day enjoying this magic place. So we woke up early to ride the other opposite direction and see what the hills and mountains would look like in the early morning. A viewpoint offers a whole sight over the valley and the canyon. 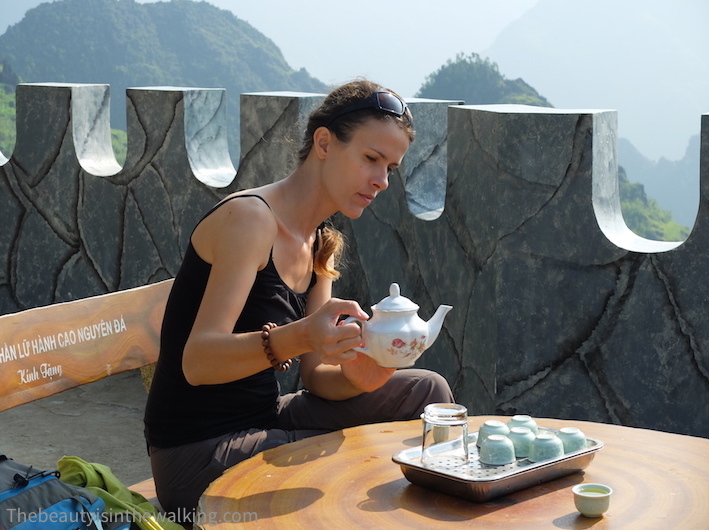 We stop off only long enough to enjoy the view and wake up drinking a “snow tea” in the sunlight. We were about to leave when a Vietnamese man with a loud voice and a happy face started the conversation. He often comes in the region, because he ‘fell in love’ with the place. He is sitting around a table with a friend and his chauffeur, and invites us to join them. He is in the stone and steel trades, and happy in business. Perhaps, this is the reason why he often comes to this region. 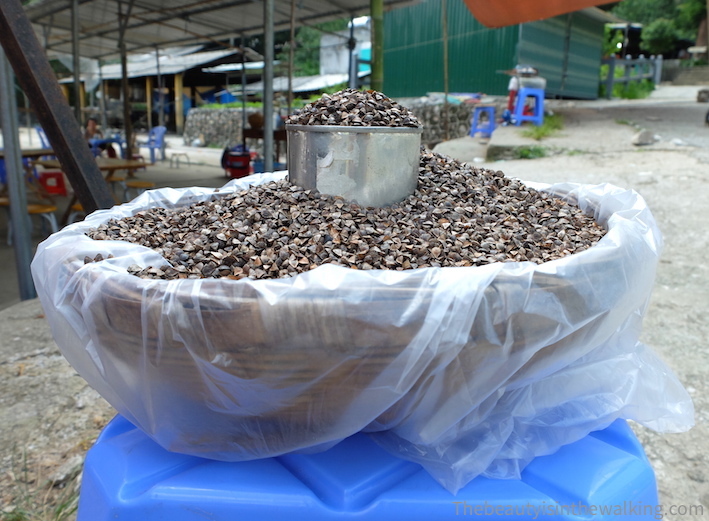 He quickly fills for us a little bag of plums he has just bought and puts a glass of… rice wine in our hands. Oh, OK, that’s why he looks so happy! How can we tell him without being rude that for us it is too early? He is so generous. Well, let’s close our eyes and… hop! We drink the shot down in one gulp. Argl… THAT is strong! I let Erik manage with him for the next shots – between men… he, he –, well not too many either because I’m not sure that the scooter can take us back by itself. As for me, I am satisfied with eating plums. If I have to choose, I prefer getting sick on plums than drunk at this early hour. The fact remains that our new friend is delighted by our presence, and we by his. It is funny because he shows off his success by listing all the things he wears and the price they have cost. The more expensive they are, the longer the silences last between two sentences. He is quite an appealing character with a heavy smoker’s smile, his GSM in solid gold, his chatty nature and strong generosity. 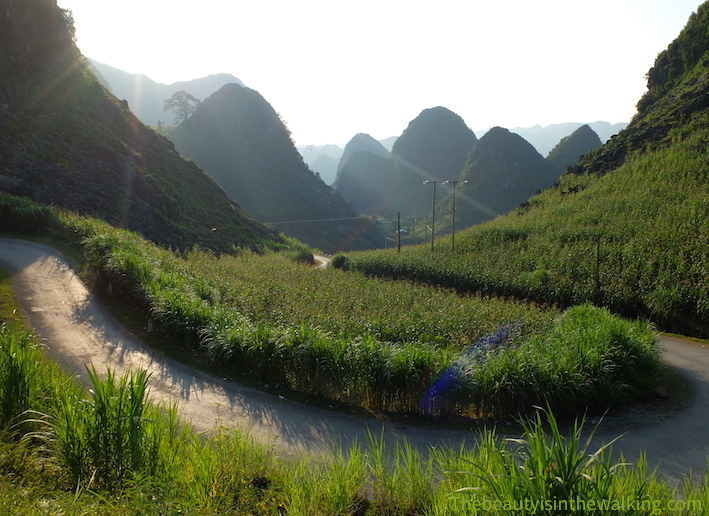 When we finally leave, the light is so beautiful on this portion of the road with its sharp mountains. 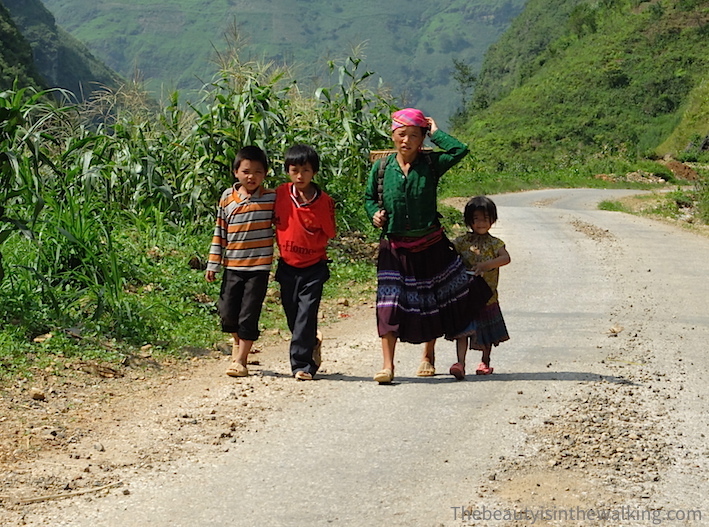 Still not a soul, except Hmong people from time to time. 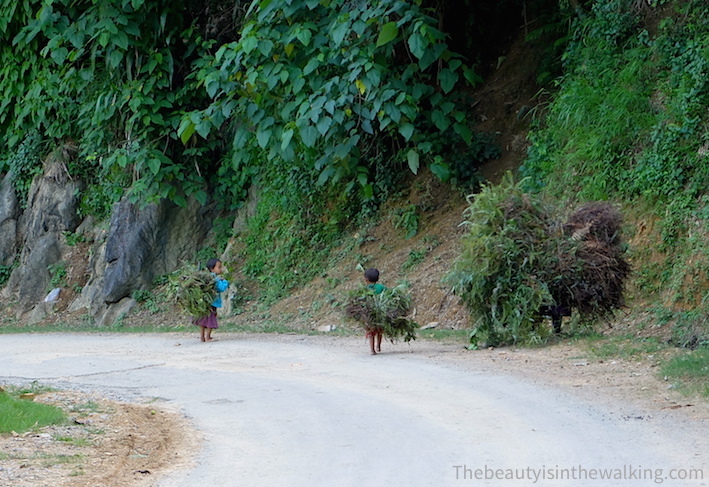 They are walking, carrying loads or not, and the women wear bright coloured clothes and hold a pruning knife. We can read the harshness of this life on their faces. They don’t smile often. Our lives are so different. We often ask ourselves how they view us. When we arrive in Đồng Văn, it is time for a coffee-yoghurt – our favourite drink since Hanoi. 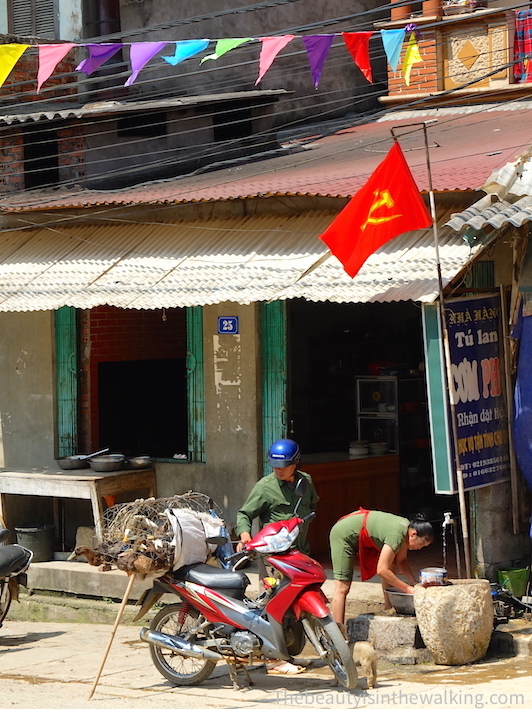 Then we cross over to the opposite restaurant to eat a phở with duck, the one we saw being plucked an hour earlier from the terrace of the café. Let’s just say, it sure is fresh food. The duck seller parks his scooter in front of the restaurant. On his rack, a cage made of a roll of fence wire holds around ten ducks heaped the ones on top of the others and constantly moving in the hope of finding a bit of space. The cook comes close, chooses one of the ducks, and argues about the price. And in no time, the poor animal is being plucked under clear water. 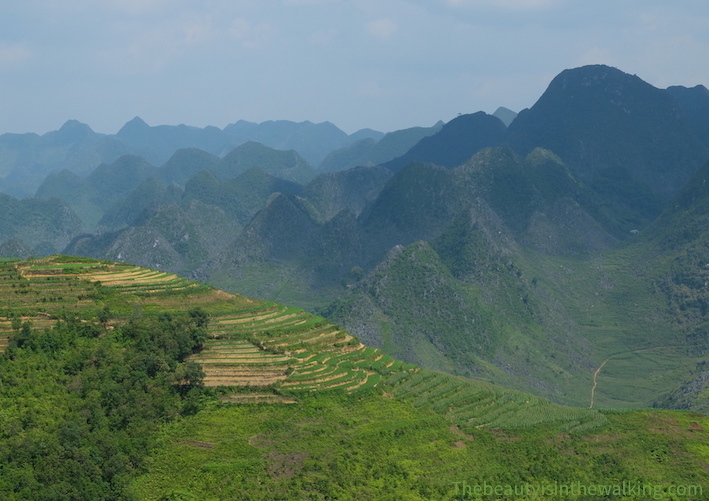 Now we are full, the heat is more bearable and we are on our way back to Mèo Vạc. The light is heavenly. (Have we already said that before?). We never grow tired of such a landscape. And we think about the people living here. Are they fed up with those beauties every day? We could also ask ourselves the same question: are we tired of seeing our Alps back home? I don’t think so. They certainly aren’t either. By the way, we can often see some people on the roadsides, seated on the safety barriers or concrete blocks as a protection against the void. They are waiting, watching around, or having a rest. They live out and embody their environment. 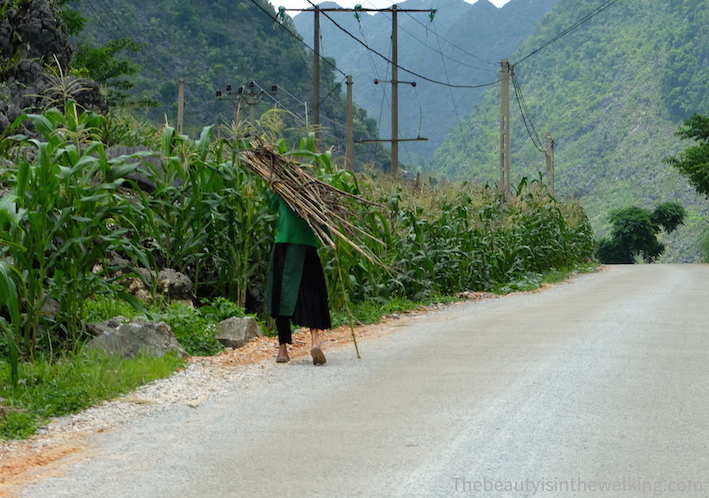 Let’s not forget this Hmong woman we saw standing on the other side of the safety barrier, a few inches from the void, cutting grass with her pruning knife. It makes us dizzy! 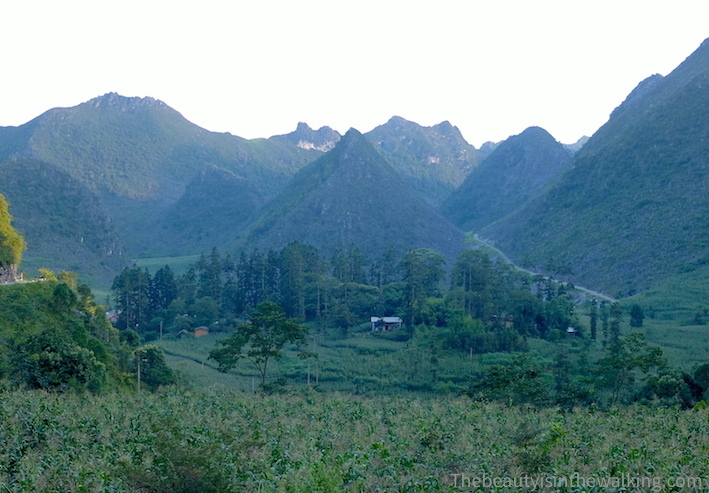 At the end of the day, we decide to go down the valley towards Xín Cái village to get closer to the river and try without much hope to reach the canyon. Once down, we won’t go very far, the access being forbidden as a company is using the water or sand. The other road is out of use. However, no regret. 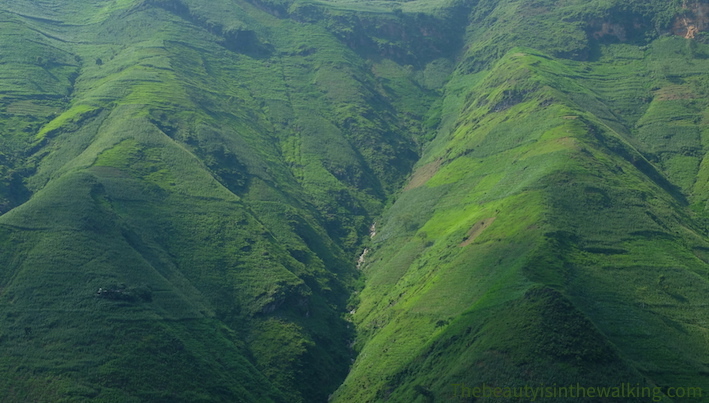 On the road to go down, it’s as if we were wrapped in greenery. Sometimes, we can see children shooting out of a field to the side of the road with a bright smile. Dishevelled hair, dirty cheeks and running nose, they are so cute when they are waving at us yelling “bye bye” to say hello. They play together; they are self-sufficient. 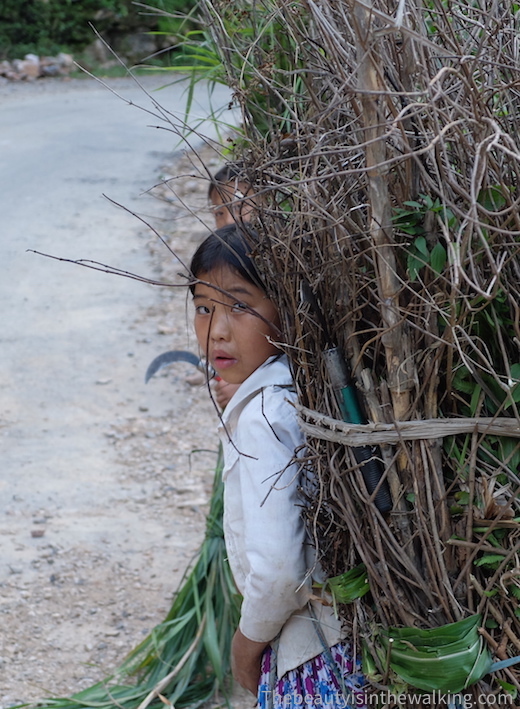 Some of them are riding down the road on handmade wooden rolling boards, and older ones are helping to build the road. 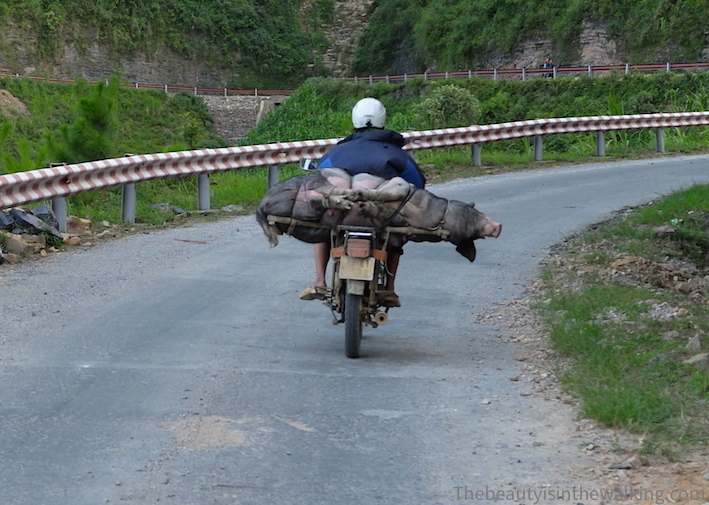 Today, we have a long ride ahead of us; another 150 km to reach Yên Minh, then Hà Giang. We should not waste time on the way. As we move along, the reliefs become smoother. 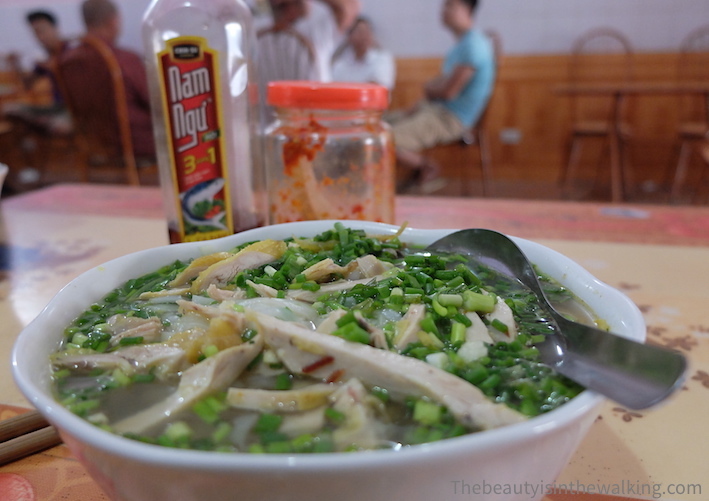 In Yên Minh, we keep to our habits: we go back to the small restaurant found on the way there and we have a bún (noodle soup). 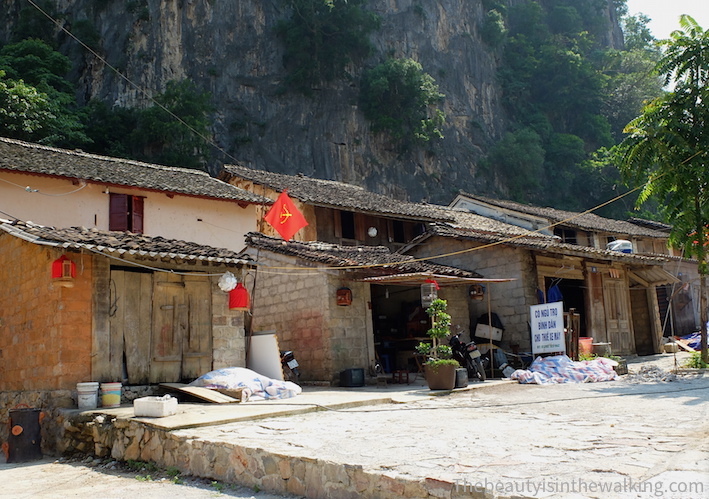 We meet the owner again, a 60-year old man and his 10-year old daughter (or grand-daughter?) with whom we had chatted. His bún is still very tasty. It gives us enough strength to do the rest of the way back. We arrive in Hà Giang late afternoon, happy to give back the scooter and find a hotel. 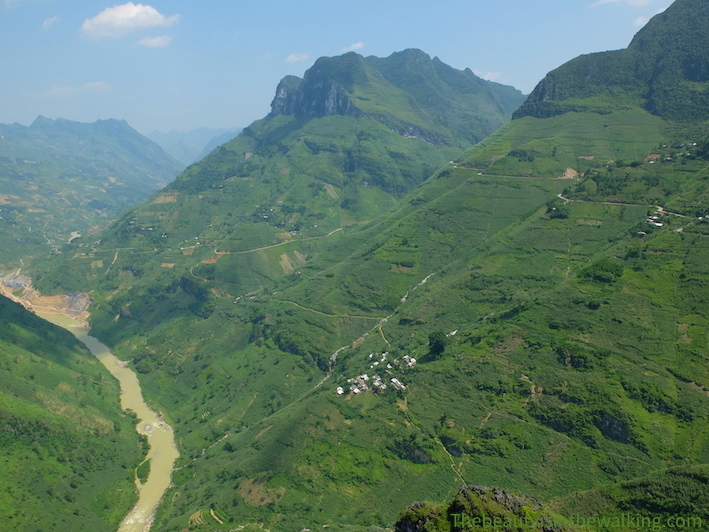 The next morning, we will leave at 6 o’clock to go to Lào Cai, a city at the border with China, the Yunnan Province where we will spend at least a month. Give to Caesar… To be honest, we have to thank Philippe. Because everything started with a great article he kindly sent us by mail. The photos were splendid, the writing promising. We could already imagine riding in the middle of this sublime nature. We were determined to go there. So, thank you, Philippe!